Oh, wow! I haven't seen this record in AGES! I used to own this one when I was growing up, too! By the way, if you can find a copy of The Peppermint Kandy Kids' "Snoopy's Christmas" album with the song "Who Stole the Mistletoe", please let me know. I've asked around for it and looked everywhere. Can't find it. I did find the other Peppermint Kandy Kids records, but that one brings back a lot of memories. a couple of years ago, a hip hop producer named Madlib and an mc that goes by the name Viktor Vaughn put out an album called Madvilain. That album has samples from this album all over it. thanks for posting. You wouldn't happen to have back cover scans/photos of this and the 2 Musical Story LPs do you? Folks at the Power Records Forum were wondering. Thanks. 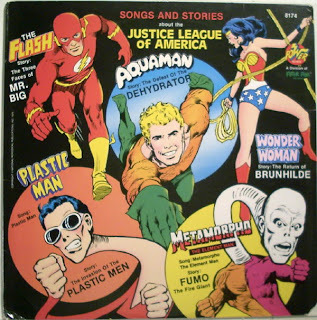 What is Plastic Man doing as a member of the Justice League of America at this time? He didn't become a member until he appeared in the JLA series in the mid-90s. Cool, I have this in my collection, its pretty good. A great find. If you want a back picture let me know ill scan it and send. Thank you. It's been years since I've heard this. Now my wife has to listen to something besides me singing Plastic Man on long, long car trips. Thank you! The cover art (and hence, probably, much if not all of the content) are from late-seventies Ruby-Spears cartoons of the characters... I watched them as a kid. My favourite bit was from the Plasticman opening, "...bouncing baby boy..." says the doc, using the kid as a superball! Thank you so much! I had the Tifton record for years until it broke. 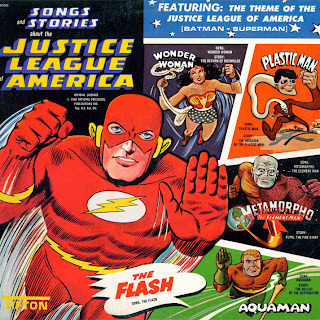 I wanted to be the flash after listening to his song. I think the original just had the song, no story. You've made me a happy man. To the most recent anonymous - this record has nothing to do with those late '70s Ruby-Spears cartoons and, in fact, predates them by about a decade.